Crowdfunding is a peer to peer funding model. I do not believe or support simple crowdfunding… While I can see the benefits of crowdfunding for well thought out businesses, concepts and ideas much too often many see it as a quick road to the end result. there are several version of what is today defined as crowdfunding models. Lending or Debt Based Crowdfunding (like Kiva) – The entrepreneur or company borrows money and must repay it (typically, with interest). Equity Based Crowdfunding (Earlyshares) Equity crowdfunding – Investors receive equity in the company or entrepreneur that is raising funds. The new equity based models are meant to go around SEC regulations of $250.000 minimum for investment. Property crowdfunding – Investors receive interest in the property from an owner who is raising funds. I recently cam across a unique service targeting creative and playing on the age old tradition of Patronage. It is a continuous funding model as opposed to a one-time donation. 6- HandUp is crowdfunding to help the homeless. 100% of donations reach members. Members redeem donations via our trusted network of community partners. Patch of Land is crowdfunding asset-backed residential and commercial real estate debt using its proprietary technology and processes. Patch of Land creates efficiencies in the real estate debt market, and provides access to these investment opportunities through a peer-to-peer crowdlending marketplace. 10 A – DIY crowdfunding www.crowdtilt.com is one of teh most flexible latforms allowing you to shape teh campaign you need read and explore carefully you can Collect Money which is Free, Fundraise or pretails/sell at 2.5%. Moreso it allows you to host on your site with Tilt Open or use their API. 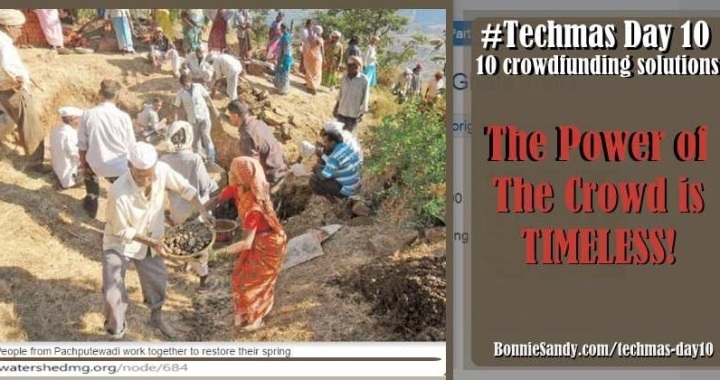 10 B – CrowdfundingBank is one of the original platforms I discovered on the peer to peer sitess. Their site offers a wealth of info on the topic of crowdfunding. Their platform offers “crowdsourcing with crowdfunding”. In other words we are the combination of a startup accelerator with a crowdfunding platform. Open to new members and transparent in terms of operations, we are focused on helping projects to succeed. Creating a web presence outlining your project or proposal, specifying requests and any offers or enticements for backers. Setting up an account with payment processor such as PayPal or Amazon. Promoting to potential backers via social hubs like Facebook, Twitter and LinkedIn. Tracking progress, making campaign adjustments, processing contributions and fulfilling promises if successful. It should also be noted that apart from crowdfunding . There is bootstrapping – the lean stratup as well as cultural funding now often called peer to peer funding.